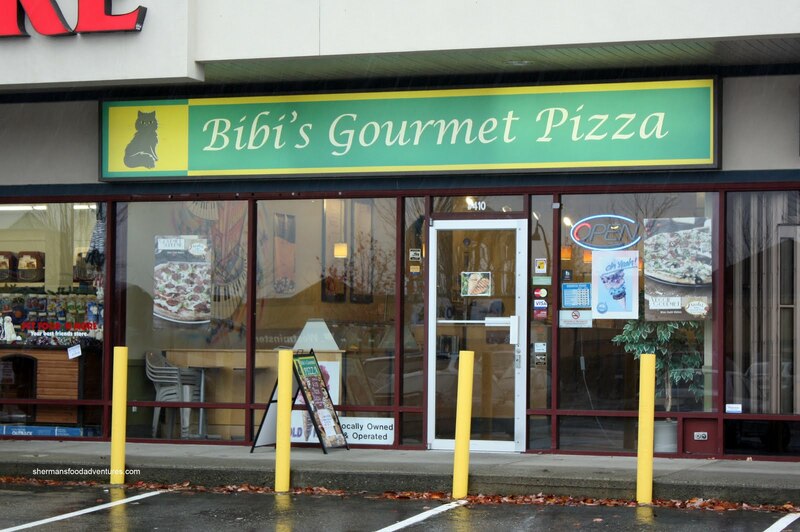 Realistically, Vancouver is not exactly a great place to find good pizza of any sort. Before people bring out the knives in support of their favourite pizza, let me explain. Compared to NYC, believe me, Vancouver doesn't hold a candle when it comes to pizza. 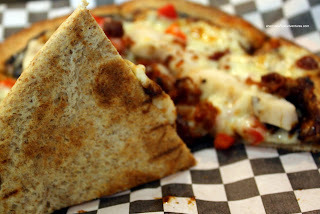 For some reason or another, we are inundated by the dreaded chain restaurant pizzas. Don't get me wrong here, I'm not slagging them. In fact, we order from them every now and then. They do the job. Just nothing all that interesting. So whenever I spot an independent establishment advertising themselves to be "gourmet", I need to give them a shot. 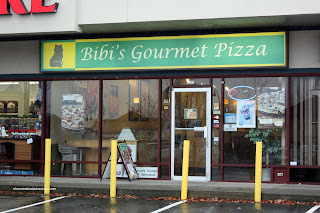 That has brought m e to Bibi's Gourmet Pizza out in Newton. Formerly Nadia's, there doesn't seem to be much different about the place. 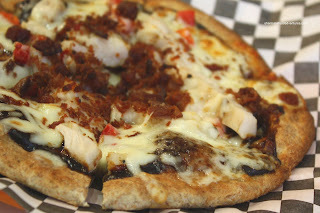 For variety purposes I had 2 of their personal size pizzas starting with the BBQ Chicken on whole wheat crust. Rather than pizza sauce, there was BBQ sauce which I suspected to be Bull's Eye Original. On top, there was mozzarella, red peppers, chicken and what looked to be either Kirkland or Hormel brand prepared bacon. Despite the obvious ingredients purchased from Costco across the street, the pizza was actually quite good. The whole wheat crust was crispy and light. Yes, light. Normally, whole wheat crusts can be dense. I actually liked this one. The toppings were pretty generic; but they weren't terrible. 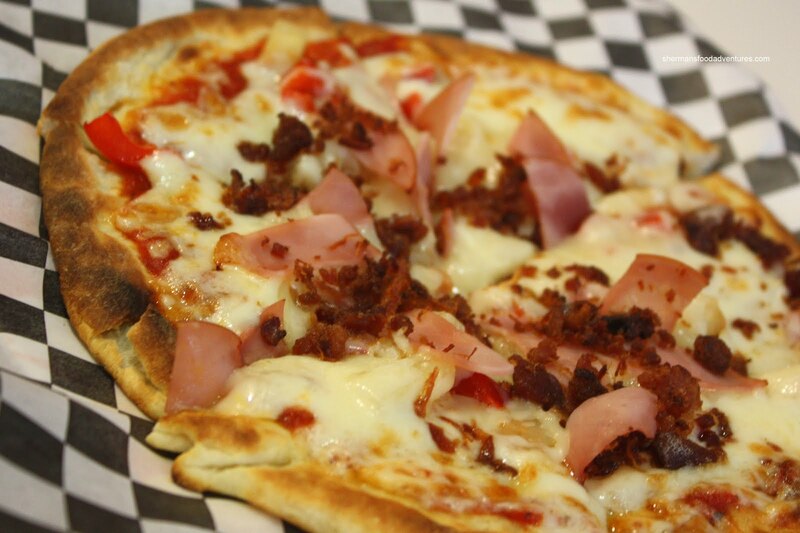 For my second pizza, I got the Hawaiian and as the name suggests, there was mozzarella and ham with the addition of red peppers and more prepared bacon. I got this one with a regular crust and it was only okay for me. Sure it was crisp and relatively thin, nothing wrong with it. Just not all that interesting. I actually liked the whole wheat more. Once again, a decent pizza. Yah, nothing amazing here; but then again, I would rather eat this than going to Pizza Hut. Nothing wrong with Pizza Hut either since I do eat their pizzas occasionally as well. However, their prices are reasonable and they are unlike most chain pizza joints. As a lunch special, their personal size pizzas are only $4.00 each with pop. Not bad considering $4.00 won't get you even a meal at most fast food restaurants these days.